The chicks are about a week old and are growing fast. They seem to be equal competitors for food and there is not much of a size difference between the oldest and youngest. The weather has warmed up considerably. Just a couple days ago it was below freezing at night. Now is it in the 80s. The chips spread out in the heat of the afternoon rather than huddle into a big downy ball. They will seek shade in the corner of the box under the camera, so they are not always all visible. 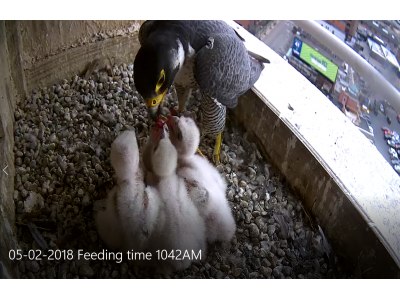 Now that it is warmer, the parents do not have to keep the chick warm and can leave for longer periods or sit on the edge of the box. Even if you do not see a parent bird in the box, rest assured that one or both are very close by. Sometimes one is standing on the top of the nest box and you might see that from the parapet camera.